Hi friends! Mallory here! 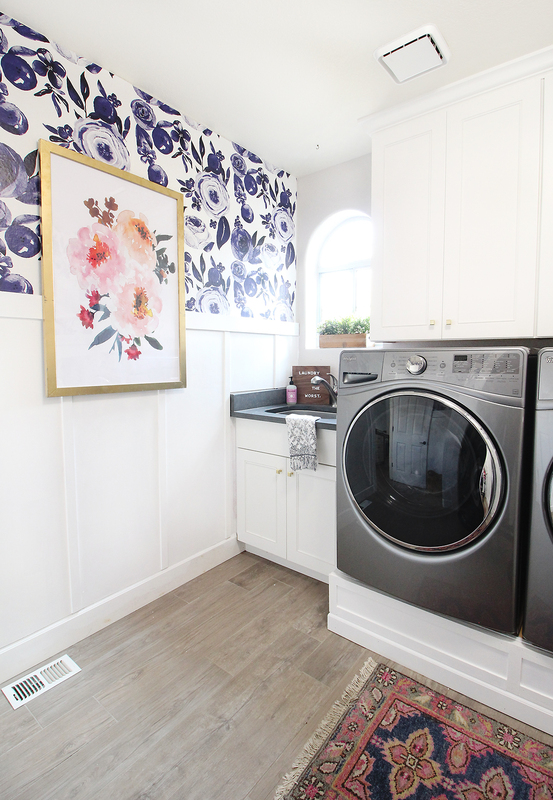 I’m still alive and I am excited to finally be sharing a Laundry Room Makeover with you all! This pregnancy and broken foot have really slowed me down! haha! 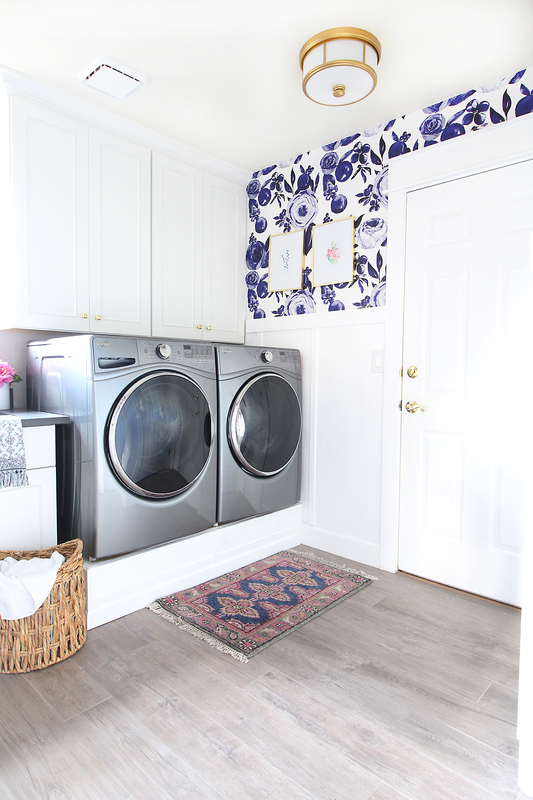 The laundry room, as you can imagine, gets a lot of use in a family of 6 (almost 7!). I have always felt that its easier to do tasks that you don’t particularly like when you enjoy the space you’re in. Luckily, this was not a huge renovation and mostly needed cosmetic upgrades to fit our style and a few changes for the function of the space. The previous owners (and our dear friends!) installed beautiful wood-looking tile, new cabinets and a beautiful countertop which already provided an excellent layout and function to the space. We were due for a little upgrade, mostly regarding size, of our old washer and dryer! We worked with Home Depot and ordered a new washer and dryer online. Man, I love ordering things online and The Home Depot makes it so easy. If you follow us on Instagram, you saw our stories about how convenient the whole process was. 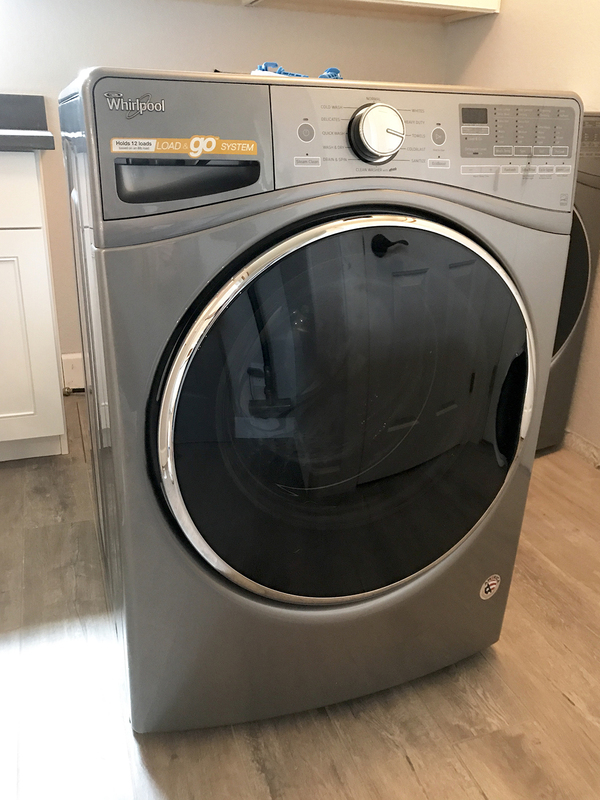 I chose the Whirlpool 4.5 cu. ft. Front Load Washer and the 7.4 cu. ft. Front Load Gas Dryer in Chrome Shadow. I loved this set because it checked off all of my must-haves with a few added bonuses! 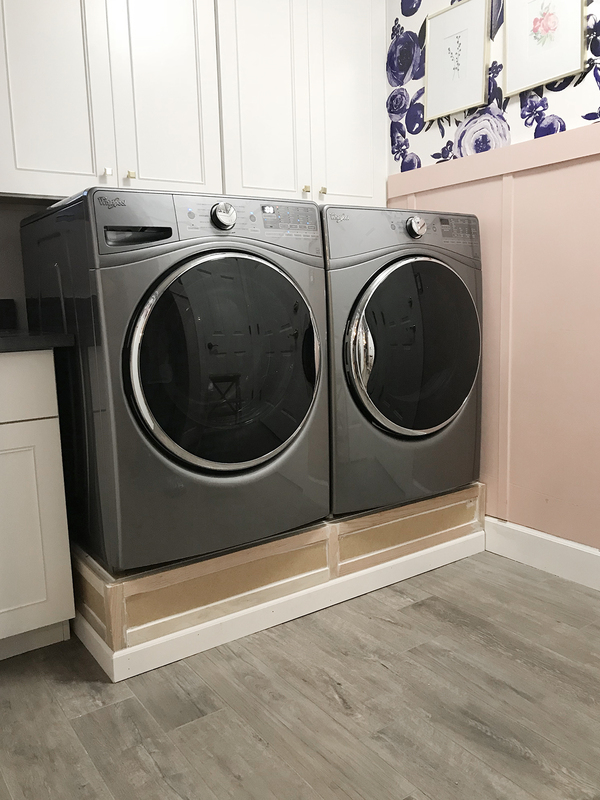 Washer: Load and Go – This feature allows you to fill the washer with 12 loads worth of detergent so you don’t have to refill the detergent every time. Washer: Wash & Dry cycle washes and dries a small load in the washer! Isn’t that cool? The Home Depot set up the delivery and two helpful men placed my old set in the garage and delivered and installed my new set on a dreary rainy day! It certainly brightened my day! 😉 I seriously love ordering appliances (and anything else!) online from Home Depot. I have ordered 2 refrigerators and a stove in the past with the same great experience. 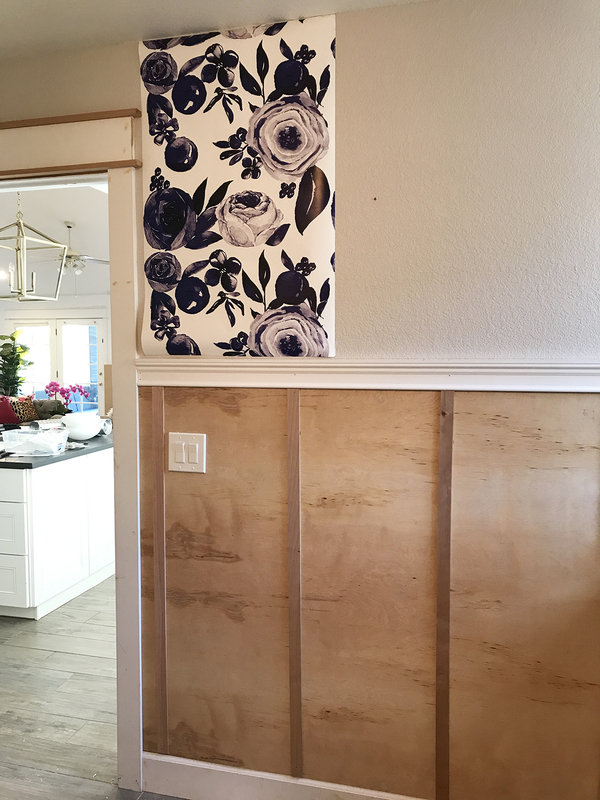 I wanted to add some character to the space so I installed this blue floral wallpaper from Spoonflower.com and added some DIY board and batten to the walls. 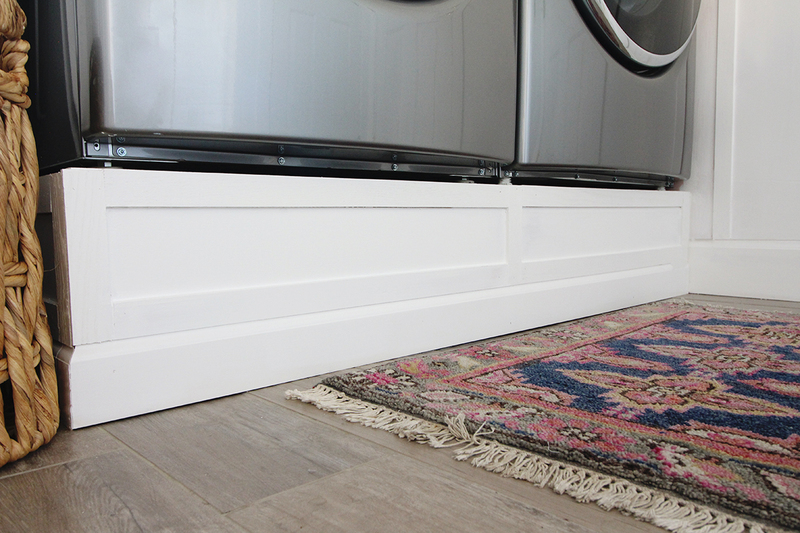 Since we have textured walls, I used 1/8″ underlayment to install over the walls to make it nice and smooth and used 1.5″ lattice trim, installed vertically to the walls. I was going to do this decorative moulding for the top but the angles started getting really tricky to miter and my math brain just wasn’t working as well as I’d hoped. haha! I went with a smooth 3.5″ MDF board for the top piece and I love that clean craftsman looking style even better! Next, I painted the new trim work pink and loved the color! It was perfectly girly and fun until I ran into a problem. I hated how the added color made the room feel so much darker. Don’t be fooled by the bright photos, this space does not get very good natural light due to the small window and large tree in front of it. I get good natural light for about 2 hours a day. Otherwise, it’s pretty dark in the space. No one wants to do laundry in the dark so I repainted it all white. 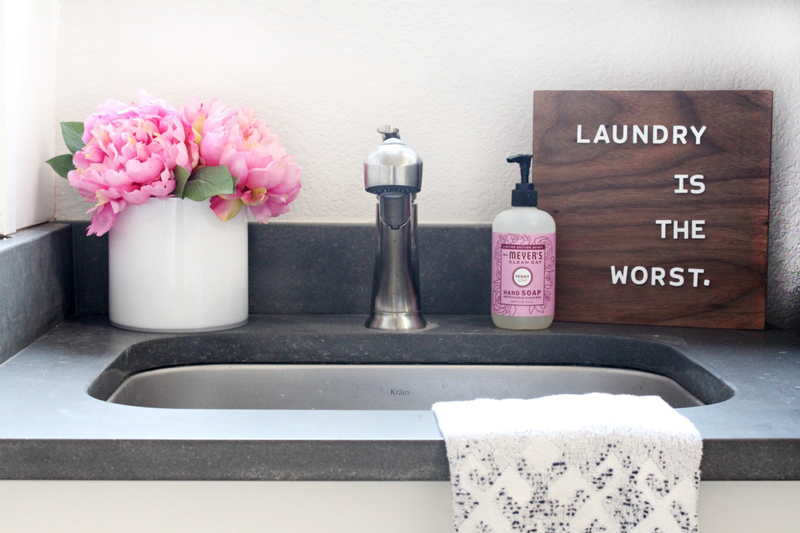 Finally, we built a DIY laundry pedestal that came together very quickly and made a huge change to the function and design of the room. I will share a tutorial very soon! 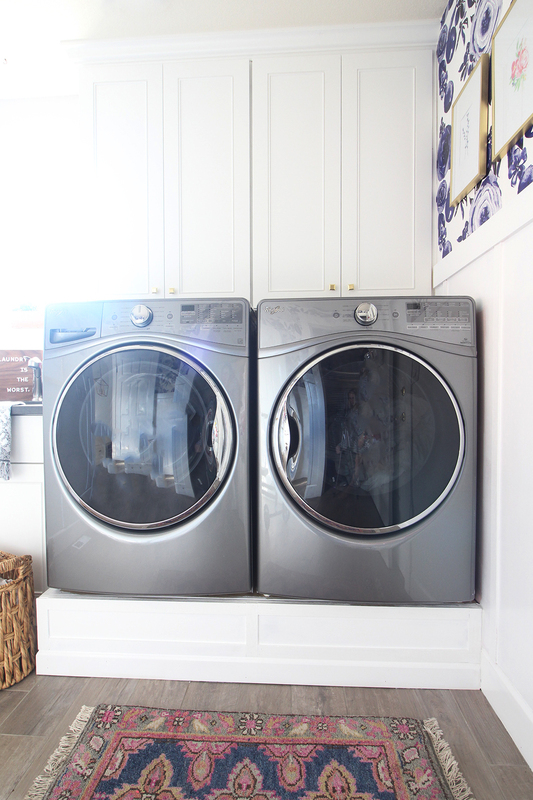 It’s really easy and I love how it made it so much easier to reach the front load doors on the washer and dryer! We upgraded the lighting with a new gold flush mount light that I found on Amazon. The rug is from the Kismet Rug in Navy from Caitlin Wilson and the wallpaper is a The Art Werks design printed by Spoonflower.com. The floral print is a digital download from Little Creek Creative on Etsy. The gold frame is just a poster frame from Michaels that I spray painted gold. The wooden letterboard is my favorite! LOL! It’s from Jut Made! 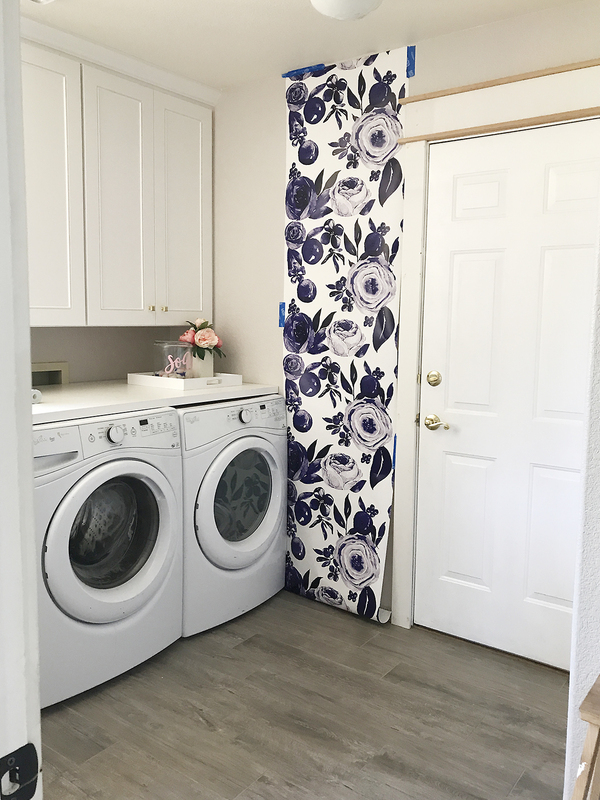 I hope you have enjoyed my Laundry Room Makeover. 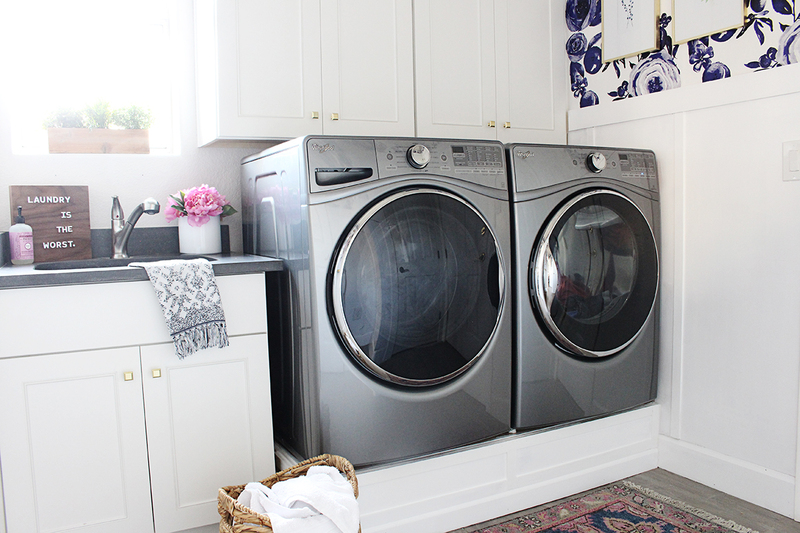 Your laundry room turned out amazing! I love your floor. I know you said the previous owners installed it, but do you by chance know what it’s called and where they got it? (You said they are your friends, so I’m hoping.) We’re looking for wood-look tile for our home, and it’s so hard to choose! I am so in love with this space! That wallpaper is a total dream and I agree, I’m diggin the white in this space as opposed to the pink. 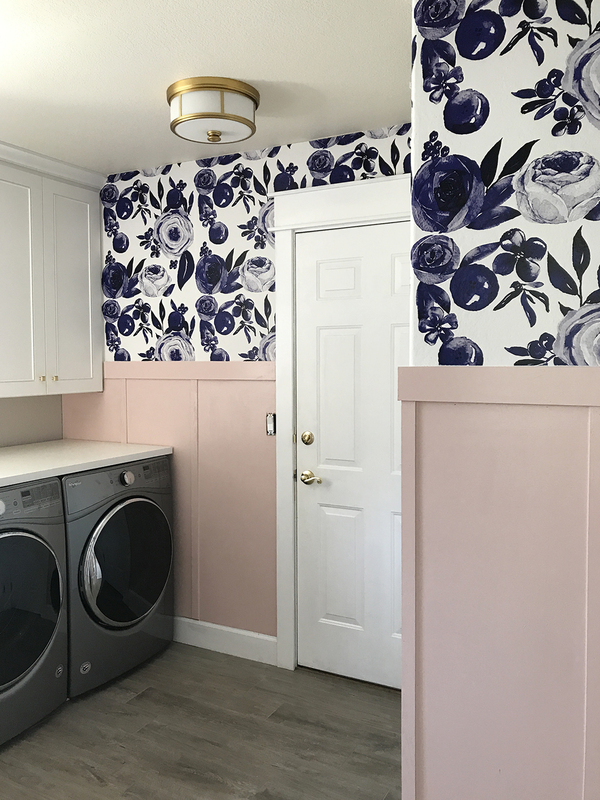 I am so excited to see where you go with this house because I have loved everything I have seen so far 🙂 The living room is probably going to be my favorite next to this fabulous laundry room of course. 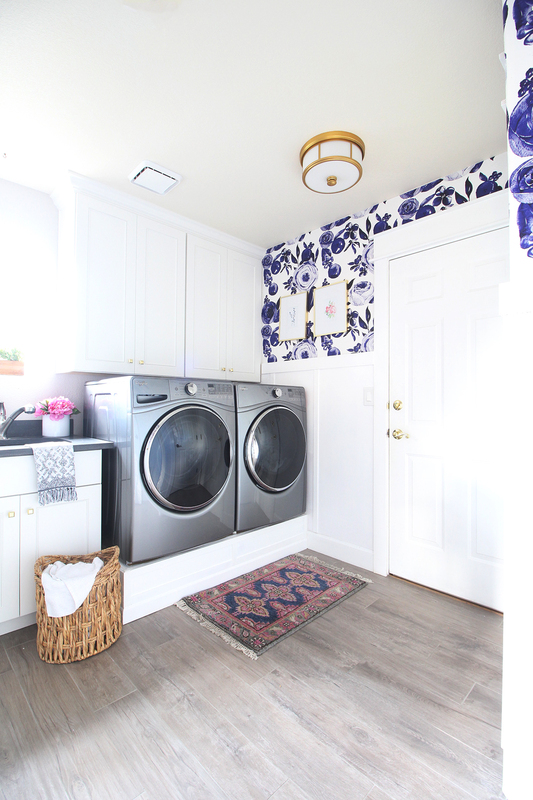 Amazing re-design of the laundry room. I like the purple wallpapers so so much. Where are your door handles from?? So, on a scale of 1-10, how quiet is your washer and dryer? 1 being silent and 10 being, well, loud.